You home is an expression of your personality, your likes, your interests, and your hobbies. If you are someone who has recently moved into a new home, one of the most exciting yet time-consuming tasks is decorating. There are numerous magazines and blogs that provide detailed descriptions and tutorials on how to style your master bedroom, living room and even your kitchen. However, one room that has not enjoyed enough limelight is your kids room. Many homemakers often choose to leave the room without too much effort under the assumption that the child will spoil it anyway. However, just like yourself, your child also needs a space that will inspire him or her to think creatively, have fun and relax. You can personalise your child’s space by adding elements that interest them such as space or unicorns. In order to gain some kids room inspiration, one of the best things to do is to sit down with your child and understand what he/she likes, their favourite colours, characters, animals etc. This exercise will not just give you some precious quality time with your child but also spark some kid’s room décor ideas. One vital tip while decorating your kids room is to avoid placing random items all over the place. Zero down on one idea. Themes for kid’s rooms can vary from beaches to pink princesses or even a whimsical forest. This will make your job much easier. Now all you have to do is purchase items around that theme. Drawing inspiration from multifunctional kids camps, here is a red-indian camp room. One of the main attractions of this room is undoubtedly the Tee-pee. These tent-like structures are available online, however, if you want to get really crafty, you can even make them yourself. All you need is a couple of wooden dowels and a sturdy canvas sheet. You can add wooden elements such as wooden crates, feather hats and wild stuffed animals. Is your kid fascinated by the world beyond? Of space, planets and stars? Then you can centre your kid’s room on a space theme. The best way to incorporate this element is by painting a wall black with white dots of varying sizes. You can also choose a realistic wallpaper that gives the same starry cluster effect. If you want to go all out, you can add a rocket structure. If not then limiting yourself to some vibrant space bedsheets will still do the trick. One of the easiest themes to incorporate into a space, florals add a beautifully soothing environment. 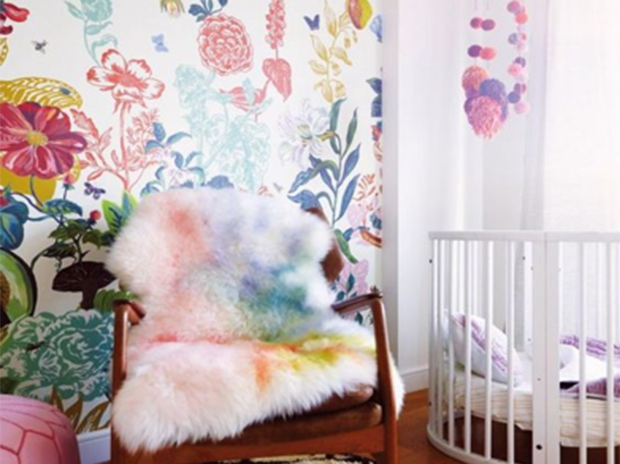 If you have a newborn, a subtle floral wallpaper along with white, pink and green tones can give off a calming vibe to the room. The best way to incorporate floral is through some colourful wallpaper. For those inspired by the life of Little Mermaid of Nemo, this is an ideal room idea for you. You can either go all out or paint the wall and ceilings in a beautiful cobalt blue. Add on some sea-creatures to the mix and you have an aquarium feel. If you want to play it low-key, then opt for shades of blue in terms of furniture, curtains and rugs. You can also add fish wall stickers and stuff toys. Drawing inspiration from the underwater theme, here is an overwater ship idea. The nautical colours are typically red, white and navy blue. You can play around with these colours in terms of furniture. Add cute bedsheets with sharks on them; maybe repurpose an oil boat to make it a shelf. Do not forget the main element, anchors. Nothing screams nautical like anchors. If playing in the forest like Alice in Wonderland or Peter Pan is something your child fancies, then give them a space that reminds them of the mysterious forest. Here green and brown are the main colours to play with. You can get creative by incorporating real wooden twigs into the space or maybe a small birdhouse. Do not forget to add plants, as they will give the room an authentic feel. For every girly girl out there, here is a room that will soothe your sense and fulfil all your dreams. Give your child a fantasy princess room with chandeliers, dusky pink elements, a canopy or even a quilted chair and an ottoman set. Make sure the bedding is big and flouncy. Hot air balloons are very fascinating, whether they are flying over Copenhagen at sunrise or in your child’s room. You can get creative and create makeshift hot air balloons or get a very pretty wallpaper to do that for you. Make sure the other elements are relatively subtle so that the focus does not shift off the balloons. Here is an idea for those parents who are still unsure of their child’s interests. On the other hand, maybe their child is still young and does not really have any specific likes and dislikes. In such a case, choosing to go for a monochrome theme will save you a lot time and money. Choose subtle tones of grey and white. Here this may not necessarily be an overall theme, but it can add some fun stylistic elements to your kid’s room. You can make your own clouds with cotton and add lights inside to replicate the image on the left. If not, then use the same lights to make wall art of your own.